Elden Tefft was a longtime professor of sculpting at the University of Kansas. He created several of the landmark pieces that reside on KU’s campus. He had long dreamed of creating a piece in bronze that captured Dr. Naismith’s spirit and his prominence as the creator of basketball. Not just one sculpture did he dream of, but three. One to live in Naismith’s hometown of Almonte, Canada, a second at Springfield College, and a third on the KU campus. He began work on the sculptures with no financial commitment for any of the three pieces, and saw two of them dedicated and a third started. Sadly, he passed during the sculpting of the third statue that would eventually rest just outside the DeBruce Center’s front door. But his son, Kim Tefft, completed the project and personally oversaw the placement of the third and final Naismith statue, as seen in the video below. Video courtesy of the LJWorld. 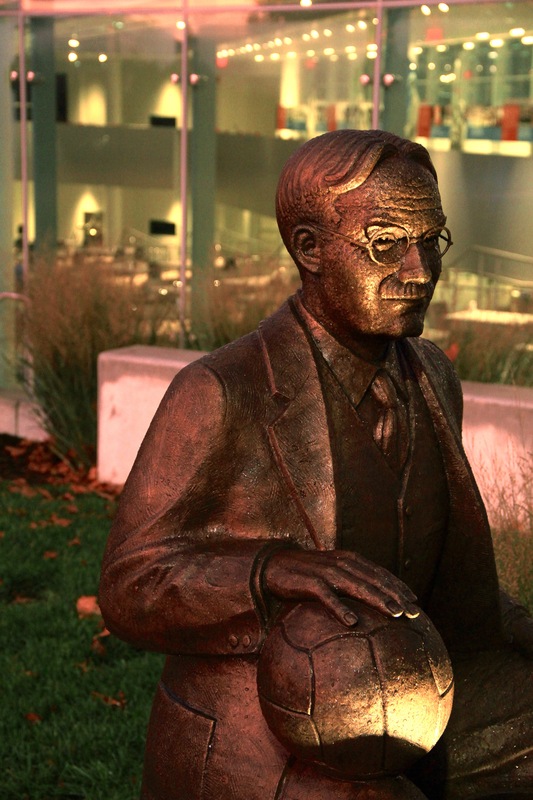 Dr. Naismith sits with his basketball and peach baskets on a stone bench outside of the DeBruce Center, welcoming visitors to come sit beside him. He particularly enjoys having "selfies" taken with Jayhawk fans of all ages. The completion of the statue was made possible by KU Alumnus Tom Wiggans and his wife, Kathy Wiggans, of Atherton, CA. Video courtesy of KU Athletics.